© 2007, id Software, Inc.
A high performance texture compression technique is introduced, which exploits the DXT5 format available on today's graphics cards. The compression technique provides a very good middle ground between DXT1 compression and no compression. Using the DXT5 format, textures consume twice the amount of memory of DXT1-compressed textures (a 4:1 compression ratio instead of 8:1). In return, however, the technique provides a significant gain in quality, and for most images, there is almost no noticeable loss in quality. In particular there is a consistent gain in RGB-PSNR of 6 dB or more for the Kodak Lossless True Color Image Suite. Furthermore, the technique allows for both real-time texture decompression during rasterization on current graphics cards, and high quality real-time compression on the CPU and GPU. Textures are digitized images drawn onto geometric shapes to add visual detail. In today's computer graphics a tremendous amount of detail is mapped onto geometric shapes during rasterization. Not only are textures with colors used, but also textures specifying surface properties (such as specular reflection) or fine surface details (in the form of normal or bump maps). All these textures can consume large amounts of system and video memory. Fortunately, compression can be used to reduce the amount of memory required to store textures. Most of today's graphics cards allow textures to be stored in a variety of compressed formats that are decompressed in real-time during rasterization. One such format, which is supported by most graphics cards, is S3TC -- also known as DXT compression [1, 2]. Compressed textures not only require significantly less memory on the graphics card, but also generally render faster than uncompressed textures, due to reduced bandwidth requirements. Some quality may be lost due to the compression. However, the reduced memory footprint allows higher resolution textures to be used such that there can actually be a significant gain in quality. The DXT1 format [1, 2] is designed for real-time decompression in hardware on the graphics card during rendering. DXT1 is a lossy compression format with a fixed compression ratio of 8:1. DXT1 compression is a form of Block Truncation Coding (BTC)  where an image is divided into non-overlapping blocks, and the pixels in each block are quantized to a limited number of values. The color values of pixels in a 4x4 pixel block are approximated with equidistant points on a line through RGB color space. This line is defined by two end-points, and for each pixel in the 4x4 block a 2-bit index is stored to one of the equidistant points on the line. The end-points of the line through color space are quantized to 16-bit 5:6:5 RGB format and either one or two intermediate points are generated through interpolation. The DXT1 format allows a 1-bit alpha channel to be encoded, by switching to a different mode based on the order of the end points, where only one intermediate point is generated and one additonal color is specified, which is black and fully transparent. The images below show a small section of image 14 of the Kodak Lossless True Color Image Suite . The image on the left is the original. The image in the middle shows the same section of image 14, which was first downscaled to a quarter the size and then upscaled to the original size with bilinear filtering. The image on the right shows the same section compressed to DXT1 format. of the Kodak Image Suite. to a quarter the size. The DXT1-compressed image has a lot more detail than an image first downscaled to a quarter the size and then upscaled to the original size with bilinear filtering. Furthermore, the DXT1-compressed image uses half the storage space of the image downscaled to a quarter the size. The DXT1-compressed image does, however, have a noticeable loss in quality compared to the original image. The DXT1 format is designed for real-time decompression in hardware, not real-time compression. Whereas decompression is very simple, compression to DXT1 format typically requires a lot of work. There are several good DXT compressors available. Most notably there are the ATI Compressonator  and the NVIDIA DDS Utilities . Both compressors produce high quality DXT compressed images. However, these compressors are not open source and they are optimized for high quality off-line compression and are too slow for real-time use. NVIDIA also released an open source set of texture tools  which includes DXT compressors. These DXT compressors also aim for quality over speed. There is an open source DXT compressor available by Roland Scheidegger for the Mesa 3D Graphics Library . Another good DXT compressor is Squish by Simon Brown . This compressor is open source but it is also optimized for high quality off-line compression and is typically too slow for real-time use. Until recently, real-time compression to DXT1 format was not considered to be a viable option. However, real-time compression to DXT1 is quite possible, as shown in , and the loss in quality compared to the best possible DXT1 compression is reasonable for most images. The RGB colors in a 4x4 block of pixels tend to map well to equidistant points on the line through the extents of the bounding box of the RGB color space, as that line spans the complete dynamic range, and tends to line up with the luminance distribution. The images below once again show the small section of image 14 of the Kodak Lossless True Color Image Suite . 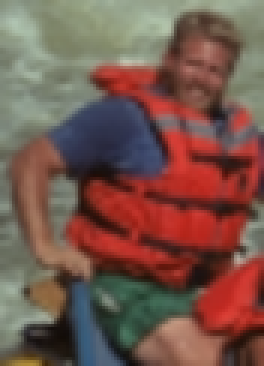 This particular section of image 14 shows some of the worst compression artifacts that may occur due to DXT compression. The image on the left is the original. The image in the middle shows the same section compressed to DXT1 with the best possible quality. The image on the right shows the result of the real-time DXT1 compressor. There are noticeable artifacts when using the real-time DXT1 compressor, but the best possible compression to DXT1 format also shows a noticeable loss in quality. For many images, however, the loss in quality due to real-time compression is either not noticeable or quite acceptable. The DXT5 format [2, 3] stores three color channels the same way DXT1 does, but without 1-bit alpha channel. Instead of the 1-bit alpha channel, the DXT5 format stores a separate alpha channel which is compressed similarly to the DXT1 color channels. The alpha values in a 4x4 block are approximated with equidistant points on a line through alpha space. The end-points of the line through alpha space are stored as 8-bit values, and based on the order of the end-points either 4 or 6 intermediate points are generated through interpolation. For the case with 4 intermediate points, two additional points are generated, one for fully opaque and one for fully transparent. For each pixel in a 4x4 block a 3-bit index is stored to one of the equidistant points on the line through alpha space, or one of the two additional points for fully opaque or fully transparent. The same number of bits are used to encode the alpha channel as the three DXT1 color channels. As such, the alpha channel is stored with higher precision than each of the color channels, because the alpha space is one-dimensional, as opposed to the three-dimensional color space. Furthermore, there are a total of 8 samples to represent the alpha values in a 4x4 block, as opposed to 4 samples to represent the color values. Because of the additional alpha channel, the DXT5 format consumes twice the amount of memory of the DXT1 format. The DXT5 format can be used in many ways for different purposes. A well-known example is DXT5 compression of swizzled normal maps [12, 13]. The DXT5 format can also be used for high-quality compression of color images by using the YCoCg color space. The YCoCg color space was first introduced for H.264 compression [14, 15]. The RGB to YCoCg transform has been shown to be capable of achieving a decorrelation that is much better than that obtained by various RGB to YCbCr transforms and is very close to that of the KL transform when measured for a representative set of high-quality RGB test images . Furthermore, the transformation from RGB to YCoCg is very simple and requires only integer additions and shifts. High-quality compression of color images can be achieved by using the DXT5 format after converting the RGB_ data to CoCg_Y. In other words, the luma (Y) is stored in the alpha channel and the chroma (CoCg) is stored in the first two of the 5:6:5 color channels. For color images, this technique results in a 4:1 compression ratio with very good quality -- generally better than 4:2:0 JPEG at the highest quality setting. The CoCg_Y DXT5 compressed image shows no noticeable loss in quality and consumes one fourth the memory of the original image. The CoCg_Y DXT5 also looks much better than the image compressed to DXT1 format. This conversion requires just three instructions in a fragment program. Furthermore, filtering and other calculations can typically be done in YCoCg space. The chroma orange (Co) and chroma green (Cg) are stored in the first two channels, where the Co end-points are stored with 5 bits and the Cg end-points are stored with 6 bits. Even though the end-points are stored with different quantization, this results in the best quality. The end-points for the Cg channel are stored with higher precision (6 bits) than the end-points for the Co channel (5 bits) because the Cg values affect all three RGB channels, whereas the Co values only affect the red and blue channel. The 5:6 quantization of the CoCg color space can cause a slight color shift and possible loss of color. Ideally, there would not be any quantization and the end-points of the line through the CoCg color space would be stored in 8:8 format. Fortunately, the third channel of the DXT5 format can be used to gain up to 2 bits of precision for many of the 4x4 blocks of pixels. The quantization of the color space is most noticeable when the dynamic range of the colors in a 4x4 block is very low. The quantization either causes the colors to map to a single point, or the colors map to points outside the dynamic range. To overcome this problem the colors can be scaled up when the dynamic range of the colors is low. The colors are scaled up during compression and scaled down to their original values in the fragment program. The color grey is represented as the point (128, 128) when the CoCg space is mapped to the range [0,255] x [0,255]. For most images the colors tend to get closer to grey as the dynamic range of the CoCg space decreases. As such, the color space for a 4x4 block of pixels is first centered on grey by subtracting (128, 128) from all colors. Then, the dynamic range of the color space of the 4x4 block is measured around the origin: max(abs(min),abs(max)). If the dynamic range of both channels is less than 64, all the CoCg values are scaled up by a factor of 2. If the dynamic range is less than 32, then all the CoCg values are scaled up by a factor of 4. The dynamic range has to be less than 64 and 32 respectively, to make sure the color values will not overflow. In effect, scaling the colors up by 2, the last bit of all CoCg values is always set to zero and is thus not affected by the quantization. In the same way, if the colors are scaled up by 4 the last two bits are always zero and are also not affected by quantization. The scale factor 1, 2 or 4 is stored as a constant value over a whole 4x4 block of pixels, in the third channel of the DXT5 format. Stored as a constant value over a whole block, the presence of the scale factor does not affect the compression of the CoCg channels. The scale factor is stored as ( scale - 1 ) * 8, such that the scale factor only uses the two least-significant bits of the 5-bit channel. As such, the scale factor is not affected by the quantization to 5 bits and the dequantization and expansion in the DXT5 decoder, where the higher 3 bits are replicated to the lower three bits. The following figure shows the expansion of the scale factor from 5 bits to 8 bits in the DXT5 decoder. When an image is encoded to YCoCg-DXT5 like this, a little bit more work is required in the fragment program to convert back to RGB. The following pseudo-code shows the conversion. In other words, only three more instructions are necessary in the fragment program to scale the CoCg values back down. The image on the right below shows the result of YCoCg compression with scaling of the CoCg values, next to the original image on the left. For almost all images the quality is significantly higher when scaling up the CoCg values. However, it is worth noting that linear texture filtering (such as bilinear filtering) of the scaled CoCg values can result in non-linear filtering of the color values. The color values and the scale factors are filtered separately, before the color values are scaled down. In other words, a filtered scale factor is applied to filtered CoCg values -- which is not the same as filtering color values that are first scaled down. Interestingly, when measuring the quality of a bilinearly-filtered YCoCg-DXT5 compressed texture relative to a bilinearly-filtered original texture, the quality is still significantly higher when the CoCg values are scaled up, even though texture filtering can cause the colors to be scaled down incorrectly. The incorrect scaling only affects the samples on the borders between 4x4 blocks of texels with different scale factors, and most of the time the scale factors are the same for adjacent blocks. The interpolated colors between blocks with different scale factors have a tendency to converge faster to the color values from the 4x4 blocks with the highest scale factors. However, there is typically no noticeable difference in perceived quality, because it is hard to tell the difference between a bilinear filter pattern and a non-linear filter pattern. There are also no unnatural color transitions, because the Co and Cg values undergo the same non-linear filtering and will not drift apart. In other words, a color transition still follows a straight line in CoCg space -- just not at a constant speed. With the filtering being non-linear at the borders of 4x4 blocks with different scale factors, it is important that the filtered color values stay in-between the original color values from the 4x4 blocks. In other words, the color values should never go out of range -- which would cause artifacts. The figure below shows how bilinear filtering works between the texel values P0, P1, P2 and P3, with scale factors S0, S1, S2 and S3, and with the parameters 'q' and 'r'. For regular bilinear filtering the scale factors S0, S1, S2 and S3 are all set to 1, and the texel values are interpolated as follows. When the CoCg values are scaled up with different scale factors from adjacent blocks, then the filtering becomes non-linear as follows. The filtered color values should never go out of range, so for the filtered sample C(q,r) the following must hold: min( P0, P1, P2, P3 ) <= C(q,r) <= max( P0, P1, P2, P3 ). First of all, it is trivial to see that the filtered sample C(q,r) is equal to one of the original texel values at the corners. The expressions for 'a', 'b', 'c', 'd', 'e', 'f' and 'g' are either positive or negative constants based on the texel values and the scale factors. The numerator is a constant that is either positive or negative. The variable 'q' only appears once in the denominator. Furthermore, the denominator is squared and thus always positive. In other words, the partial derivative never changes sign. As with the partial derivative with respect to 'q', the partial derivative with respect to 'r' also never changes sign. Since the function C(q,r) goes through the original texel values at the corners, and the function is monotonically increasing or monotonically decreasing at a constant 'r', and also monotonically increasing or monotonically decreasing at a constant 'q', the sample C(q,r) can never go out of range and the following holds: min( P0, P1, P2, P3 ) <= C(q,r) <= max( P0, P1, P2, P3 ). Trilinear filtering and anisotropic filtering also become non-linear if the scale factors are different. However, as with bilinear filtering, the filtered samples are also nicely bounded between the original texel values. Using a regular real-time DXT5 compressor to compress to YCoCg-DXT5 does result in better quality than using DXT1 compression, and there is typically very little loss of detail . However, there are noticeable color artifacts. In particular there are color blocking and color bleeding artifacts. The real-time DXT5 compressor from  approximates the colors in each 4x4 block with equidistant points on a line through CoCg space, where the line is created through the extents of the bounding box of the CoCg space. The problem is that, quite often the wrong diagonal of the bounding box of CoCg space is chosen. This is especially noticeable at transitions between elementary colors where this causes color bleeding artifacts. To get much better quality the best of the two diagonals of the two-dimensional bounding box of CoCg space should be used. The real-time DXT5 compressor described in  can be extended to choose one of the two diagonals. The best way to decide which diagonal to use, is to test the sign of the covariance of the color values relative to the center of the bounding box of CoCg space. The following routine swaps two of the coordinates of the end-points of the line through CoCg space, based on which diagonal best fits the colors in a 4x4 block of pixels. Calculating the covariance requires multiplication of the color values, which increases the dynamic range, and limits the amount of parallelism that can be exploited through a SIMD instruction set. Instead of calculating the covariance of the color values, it is also an option to calculate the covariance of only the sign bits of the colors relative to the center of the bounding box of color space. Interestingly, the loss in quality when only using the sign bits is really small and generally negligible. The following routine swaps two of the coordinates of the end-points of the line through CoCg space, based only on the covariance of the sign bits. The routine then counts the number of colors that fall into each quadrant. If most colors are in quadrant 2 and 3, then the regular diagonal through the bounding box extents is used. However, if most colors are in quadrant 1 and 4, then the opposite diagonal is used. The routine first calculates the midpoints of the Co and Cg ranges. The color values are then compared to these midpoints. The following table shows the relationship between the 4 quadrants and the CoCg values greater than or equal to the midpoints. Using a bitwise logical XOR operation on the results of the comparisons results in a '1' only for colors that are in either quadrant 1 or 4. The results of the XOR operations for the colors can be accumulated, to count the number of colors that are in quadrant 1 and 4. If more than half the colors are in quadrant 1 or 4, then the diagonal needs to be flipped. Implementations using the MMX and SSE2 instruction sets can be found in appendix C and D respectively. The MMX/SSE2 instruction 'pavgb' is used to calculate the midpoints of the Co and Cg ranges. Unfortunately there are no instructions in the MMX or SSE2 instruction sets for comparing unsigned bytes. Only the 'pcmpeqb' instruction will work on both signed and unsigned bytes. However, the 'pmaxub' instruction does work with unsigned bytes. To evaluate a greater-than-or-equal relationship the 'pmaxub' instruction is used followed by the 'pcmpeqb' instruction, because the expression ( x >= y ) is equivalent to the expression ( max( x, y ) == x ). The MMX/SSE2 instruction 'psadbw' is normally used to calculate the sum of absolute differences. However, this instruction can also be used to perform a horizontal add by setting one of the operands to all zeros. The MMX/SSE2 implementations in appendix C and D use the 'psadbw' instruction to add the results of the bitwise logical XOR operations. To flip the diagonal, the routine uses a masked-XOR-swap, which requires just 4 instructions. The mask is used to select the bits of two registers that need to be swapped. Assume the bits to be swapped are stored in the registers 'xmm0' and 'xmm1', and the mask is stored in the register 'xmm2'. The following SSE2 code swaps each pair of bits from 'xmm0' and 'xmm1' for which the equivalent bit in 'xmm2' is set to one. Using the masked-XOR-swap the 'minColor' and 'maxColor' byte arrays can be read directly into two registers. The second bytes can then be swapped by using an appropriate mask without having to extract the bytes from the registers. The following images show the differences between the original image, the image compressed to YCoCg-DXT5 with the real-time DXT5 compressor from , and the image compressed to YCoCg-DXT5 with the new real-time YCoCg-DXT5 compressor that uses the best diagonal. The images show that there is no noticeable color bleeding when using this small extension to the real-time DXT5 compressor. The DXT5 compressor from  insets the bounding box of color space and alpha space to improve the Mean Square Error (MSE). The bounding box of color space is inset by a total of half the distance between two points on the line through color space. There are 4 points on the line through color space and as such the bounding box is inset on either end by 1/16th of the range. In the same way the bounds of alpha space are inset by a total of half the distance between two points on the line through alpha space. In other words the bounds of alpha space are inset on either end by 1/32th of the range. A side effect of insetting the bounding box is that for blocks of 4x4 pixels with a low dynamic range (small bounding box) the points on the line through color space or alpha space may snap to points very close to each other. In that case it is much better to have the end-points of a line a bit apart such that a larger dynamic range is covered where the interpolated points will typically be closer to the original values. The following code first insets the bounding box of color space and then rounds the end-points of the line outwards, so that the line covers a larger dynamic range. In the same way the bounds of alpha space are first inset and then rounded outwards. The 'pmullw' instruction is used to upshift the values. Unlike the MMX/SSE2 shift instructions, the 'pmullw' instruction allows individual words in a register to be multiplied with a different value. The multipliers are (1 << INSET_COLOR_SHIFT) for the CoCg values stored in the first two channels, and (1 << INSET_ALPHA_SHIFT) for the Y values stored in the alpha channel. In the same way the 'pmulhw' instruction is used to shift down by using the multipliers (1 << ( 16 - INSET_COLOR_SHIFT )) for the CoCg values and (1 << ( 16 - INSET_ALPHA_SHIFT )) for the Y values. In addition to choosing the best diagonal and insetting the bounds with proper rounding, the CoCg values can also be scaled up in real-time to gain precision. The following code shows how this can be implemented as an extension to the existing real-time DXT5 encoder. To exploit maximum parallelism the CoCg values are best upscaled as bytes without requiring more bits. This seems straight forward except that there are no instructions in the MMX and SSE2 instruction sets to shift or multiply bytes. Furthermore, 128 needs to be subtracted from an unsigned byte, which may result in a negative value. It is also not possible to represent 128 as a signed byte. However, an unsigned byte can be silently cast to a signed byte and then the signed byte value -128 can be added. With wrapping properly handled this results in the exact same calculation as subtracting 128 from an unsigned byte, where the result is a signed byte, which may become negative if the original value is below 128. The scale factor is a power of two which means the scale is equivalent to a shift. As such it is possible to scale two bytes at the same time using a word multiply and the result can be masked off to remove any carry bits from the first byte that got moved into the second byte. The following code show how this is implemented where bias = 128, and scale = 1, 2 or 4. After scaling the bytes they are placed back in the [0,255] range by subtracting the signed byte value -128. The above code shows how all four bytes of a pixel are loaded into a register, but only the CoCg values are upscaled, while the Y value is multiplied by 1. This avoids a lot of unpack and swizzle code that would otherwise be required to extract the CoCg values from all pixels. The image on the right below shows the result of the extensions to the real-time DXT5 compressor, next to the original image on the left. The end result is that there are no color blocking artifacts and there is very little color shift due to 5:6 quantization. Real-time DXT1 and YCoCg-DXT5 can also be implemented on the GPU. This is possible thanks to new features available on DX10-class graphics hardware. In particular integer textures  and integer instructions  are very useful for implementing texture compression on the GPU. The image that needs to be compressed is assumed to be present in video memory as an uncompressed RGB texture. If the image were not available in video memory, it would have to be uploaded from the host. This is done using a DMA transfer, usually at a rate of almost 2 GB/s. To compress the texture, a fragment program is used for each block of 4x4 texels by rendering a quad over the entire destination surface. It is currently not possible to write the results to a DXT-compressed texture directly, but the results can be written to an integer texture, instead. Note that the size of a DXT1 block is 64 bits, which is equal to one LA texel with 32 bits per component. Similarly the size of a DXT5 block is 128 bits, which is equal to one RGBA texel with 32 bits per component. Once the compressed DXT blocks are stored to the texels of an integer texture they need to be copied to the compressed texture. This copy cannot be performed directly. However, an intermediate pixel buffer object (PBO) can be used by copying the contents of the integer texture into the PBO, and then copynig from the PBO to the compressed texture. These two copies are implemented in the video driver as very fast video memory copies and the costs are insignificant compared to the compression costs. The fragment and vertex programs presented here are optimized for NVIDIA GeForce 8 Series GPUs. From an optimization standpoint there are several important differences between a CPU and a GeForce 8 Series GPU. On the CPU there is an advantage in using integer operations to exploit maximum parallelism. However, on a GeForce 8 Series GPU most floating point operations are as fast as or faster than integer operations. As such floating point values are used whenever it is more natural or saves computation. Because of the use of floating point operations, the results obtained by the GPU implementation are not bit-equivalent to the results from the CPU implementation. However, the results are still very similar to the results from the CPU implementation. Another important difference between the CPU and a GeForce 8 Series GPU, is that a GeForce 8 Series GPU is a scalar processor. For this reason there is no need to write vectorized code. In addition, fragment and vertex programs are usually short and compilers can perform optimizations that would be prohibitively expensive for large C++ programs. As such, using a high-level shading language, it is possible to achieve almost the same performance that would be obtained by writing low-level assembly code for the GPU. The fragment and vertex programs presented here are implemented using OpenGL and the Cg 2.0 shading language . Both, off-line and real-time DXT1 compressors have already been implemented on the GPU. The NVIDIA Texture Tools  provide a high-quality DXT1 compressor implemented in CUDA that has very good performance compared to equivalent CPU implementations. This compressor, however, is designed for high quality compression -- not real-time compression. The NVIDIA SDK10  provides a sample for real-time DXT1 compression. The GPU implementation of the real-time DXT1 compressor provided here is based on that sample, but adds some of the quality improvements described in previous sections. As described in section 5, the bounding box of the color space is inset by half the distance between two equidistant points on the line through the corners of the bounding box. The end-points are then rounded outwards to avoid having them snap to a single point. This small improvement comes at no noticeable performance penalty. As mentioned in section 3, the RGB colors in a 4x4 block of pixels tend to map well to equidistant points on the line through the extents of the bounding box of the RGB color space, as that line spans the complete dynamic range, and tends to line up with the luminance distribution. The DXT1 compressors from  and  always use the line through the bounding box extents. At a relatively small performance cost, the compression quality can be improved by selecting the best diagonal of the bounding box of RGB space, similar to how the real-time YCoCg-DXT5 compressor selects the best diagonal of the bounding box of CoCg space. However, selecting the best diagonal through RGB space only affects 2 percent of all 4x4 pixel blocks from the Kodak Lossless True Color Image Suite . This is quite different from the YCoCg-DXT5 compression, where selecting the best diagonal through CoCg space affects close to 50 percent of all 4x4 pixel blocks. For the Kodak images the improvement in Peak Signal to Noise Ratio (PSNR), from selecting the best diagonal though RGB space, is generally small. For image 2 and 23 there is about a 0.7 dB improvement in PSNR, for image 3 and 14 it is an improvement of 0.2 to 0.3 dB, and for all other images the improvement is below 0.2 dB, with an average improvement over all Kodak images of 0.1 dB. Nevertheless, the improvement in perceived quality can be significant in certain areas of an image. In particular the quality may improve noticeably in areas with transitions between elementary colors. If the wrong diagonal is chosen for a block with such a transition, the colors may change completely, which can be quite noticeable to the human eye. On the other hand, the DXT1 compression format usually does not perform very well in such areas any way, and thus there may still be some form of color bleeding or blocking -- even when the best diagonal is chosen. In the end, it is a tradeoff between quality and performance. The selection of the best diagonal can improve the quality for some images at a relatively small (10% to 20%) performance cost. The GPU implementation of the DXT1 compressor can be found in appendix E. This implementation includes the code for selecting the best diagonal of the bounding box of RGB space, but it is not enabled by default. The implementation in appendix E is faster than the one from . The performance improvement is the result of carefully tuning the code for performance; eliminating redundant and unneeded computations, and reorganizing the code to minimize register allocations. The implementation of the YCoCg-DXT5 compression fragment program is relatively straightforward. As such only the relevant details are described and the differences compared to the CPU implementation are highlighted. The full implementation of the fragment program can be found in appendix E.
The first step in the fragment program is to read the block of 4x4 texels that needs to be compressed. This is typically done using regular texture sampling. However, it is more efficient to use texture fetching; a new feature that allows loading a single texel using a texture address and a constant offset, without doing any filtering or sampling. This is exposed in Cg 2.0  and fetching the block of 4x4 texels is implemented as follows. Instead of converting the fetched colors to integers, they are kept in floating point format. The algorithm then continues the same way the CPU algorithm does, except that floating point values are used. First, the bounding box of the CoCg values is computed and then one of the two diagonals of the bound box is selected. The best way to select one of the diagonals is to test the sign of the covariance of the CoCg values. This can be implemented very efficiently on the GPU, so it is not necessary to approximate the diagonal selection using the covariance of the sign bits. Just as with the CPU implementation, a scale factor is used to gain up to two bits of precision for the end-points of the line through CoCg space. However, it is not necessary to upscale all of the CoCg values, as in the CPU implementation. The end-points of the line through CoCg space are represented in floating point format, so it is possible to simply downscale the end-points after the inset has been applied, and the colors have been rounded and converted to 5:6 format. As such, the original CoCg values for each texel can be compared to the unscaled points on the line through CoCg space to find the best matching point for each texel. The scale factor itself is calculated in the same manner as the CPU implementation. After calculating the scale factor, the end-points of the line through CoCg space are inset, quantized and bit-expanded as in the CPU implementation. On the CPU, the Manhattan distance is calculated to find the best matching point on the line through CoCg space for each texel. This can be implemented very efficiently using an instruction to calculate the packed sum of absolute differences. On the GPU, however, it is more efficient to use the squared Euclidean distance, which can be calculated with a single dot product. The output of the shader is a 4-component unsigned integer vector. In the fragment program each section of the DXT block is written to one of the vector components and the final value is returned. // Output CoCg in DXT1 block. As shown in the previous sections high performance DXT compression can be implemented on both the CPU and the GPU. Whether the compression is best implemented on the CPU or the GPU is application dependent. Real-time DXT compression on the CPU is useful for textures that are dynamically created on the CPU. Compression on the CPU is also particularly useful for transcoding texture data that is streamed from disk in a format that cannot be used for rendering. For example, a texture may be stored in JPEG format on disk and, as such, cannot be used directly for rendering. Only some parts of the JPEG decompression algorithm can currently be implemented efficiently on the GPU. Memory can be saved on the graphics card, and rendering performance can be improved, by decompressing the original data and re-compressing it to DXT format. The advantage of re-compressing the texture data on the CPU is that the amount of data uploaded to the graphics card is minimal. Furthermore, when the compression is performed on the CPU, the full GPU can be used for rendering work as it does not need to perform any compression. With a definite trend to a growing number of cores on today's CPUs, there are typically free cores laying around that can easily be used for texture compression. The DXT1 format and YCoCg-DXT5 format have been tested with the Kodak Lossless True Color Image Suite . The Peak Signal to Noise Ratio (PSNR) has been calculated over the unweighted RGB channels. In all cases a custom compressor was used for the off-line compression to get the best possible quality. Furthermore, the real-time DXT1 compressor from  and the CPU implementations of the real-time YCoCg-DXT5 compressors described here were used for real-time compression of the images. The YCoCg-DXT5 format provides a consistent improvement in PSNR of 6 dB or more over DXT1. All images that spike down in PSNR value have areas with high frequency luminance changes. From a PSNR point of view neither format does particularly well encoding these areas. However, it is typically very hard to distinguish the compressed pattern from the original pattern in an area with high frequency luminance changes. The performance of the SIMD optimized real-time DXT compressors has been tested on an Intel® 2.8 GHz dual-core Xeon® ("Paxville" 90nm NetBurst microarchitecture) and an Intel® 2.9 GHz Core™2 Extreme ("Conroe" 65nm Core 2 microarchitecture). Only a single core of these processors was used for the compression. Since the texture compression is block based, the compression algorithms can easily use multiple threads to utilize all cores of these processors. When using multiple cores there is an expected linear speed up with the number of available cores. The performance has also been tested on a NVIDIA GeForce 8600 GTS and a NVIDIA GeForce 8800 GTX. The 512x512 Lena image has been used for all the performance tests. The following figure shows the number of Mega Pixels that can be compressed to the DXT1 format per second (higher MP/s = better). The following figure shows the number of Mega Pixels that can be compressed to the YCoCg-DXT5 format per second (higher MP/s = better). The figures show that real-time compression to YCoCg-DXT5 is a high performance alternative to real-time compression to DXT1. Furthermore, on a high-end NVIDIA GeForce 8 Series GPU, the real-time DXT1 and YCoCg-DXT5 compression algorithms run more than 8 times faster than on a single core of a high end Intel® Core™2 CPU. In other words more than 8 Intel® Core™2 cores would be needed to achieve similar performance. The YCoCg-DXT5 format consumes double the memory of the DXT1 format. However, the quality is significantly better, and for most images, there is almost no noticeable loss in quality. Furthermore, high-quality compression to YCoCg-DXT5 can be done in real-time on both the CPU and GPU. As such, the YCoCg-DXT5 format provides a very good middle ground between no compression and real-time DXT1 compression. RGB_ to CoCg_Y conversion and back. Copyright (C) 2007 Id Software, Inc.
// Use dot product to minimize RMS instead absolute distance like in the CPU compressor. // We have to do this in case we select an alternate diagonal.